This is the second of a three-part series over Google's augmented reality game: Ingress. Part 1 can be found here. Our second part of this series takes us into the world of portals. These little guys make up the entire game from top to bottom. You need portals to level up, make links, create fields and gain supplies. Without them, you have no game. Portals originally stood for unique places of interest, ranging from art sculptures, creative architecture and various entrance signs for parks and camps. Unfortunately the types of portals have changed since the Seer Medal was added. Lets take a look at what is required to get this medal. This is 10 accepted portal submissions for bronze, upwards to 5000 accepted submissions for Onyx. Lets just take a step back and look at that. Lets say you just gave an invite to your friend, in a small city of 50 agents. I'd venture to say, he will get 1-2 accepted submissions (unless no one else is attempting to). The problem with this medal is a few things. It favors quantity over quality. It's near impossible to obtain in already portal dense cities. It makes obtaining for new agents very difficult. Assuming we have 250,000 agents who are active. (There are between 1 million -> 5 million apk installs, so that is rounding low). That will require 2.5 million portals for everyone in the world to get Bronze. If you take the amount of regions (24, 576). This averages around 101 portals per region, and this is a very low average. As I play more, the densely packed portal locations become nothing but a farm or place for lower level agents to spam links and tiny fields to gain AP. These close portals are difficult to create fields with as there is usually multiple links that must be broken to create a link further than 250 meters. Yet, the portals that are isolated by themselves tend to be a major anchor point for tons of big fields and links. As I played in KC, there were "key" portals that were used for fields. These portals usually were isolated from others in strange locations (corners of busy intersections or abstract art 100 meters away from any road). 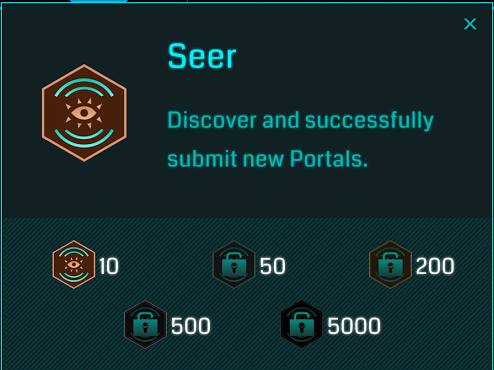 My point being, I feel the Seer medal is causing an unhealthy amount of portals. Maybe the medal should be adapted to say "Provide additional images or information on an existing portal", because everyone knows 25% of the portals were taken through a car with little effort in documenting the portal thoroughly. This would stop the abundance of ridiculous portals and help favor quality over quantity, because it upsets me to see the below abuse of portals. There isn't a single portal within 10 miles of me without a picture. If I come to a portal that doesn't have a picture, I find that thing and take a picture, if I can't find that thing, I report and move on. I once thought a community approval/removal system would be good, then I remembered how much it would be abused. Which brings me back to the point that we need to solve the problem at its root. Just like if water is dripping, a bucket will do the job for awhile, but you need to find the leak and fix it. This leak is the Seer Medal.